Carlton Manor is a Victorian villa converted into apartments on Roundham Head in Paignton, looking out towards Goodrington Sands. 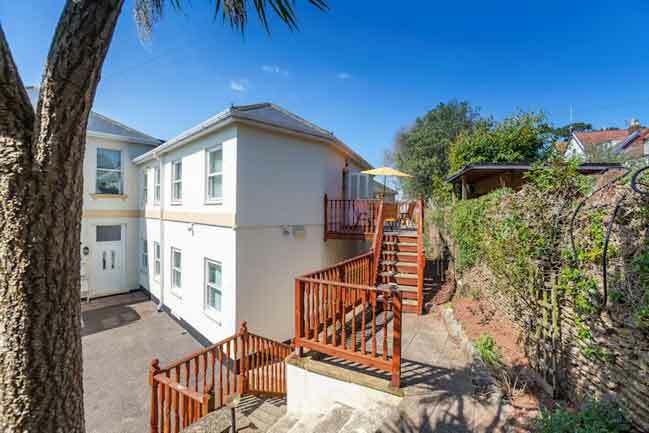 Set back on a quiet road, there is a degree of peace and tranquillity, whilst retaining the benefits of this central location in Torbay. Goodrington beach and its attractions are a 5 minute walk, while Paignton harbour, beach and town centre, where the local shops, restaurants and attractions are located, are a 5 to 10 minute walk. No.6 is a three bedroomed first floor apartment. A designated parking space is reserved for number 6 on the drive. Decking steps and a patio lead up to the front door, providing an outdoor area to enjoy the English Riviera weather.